What's going on in the workshop? 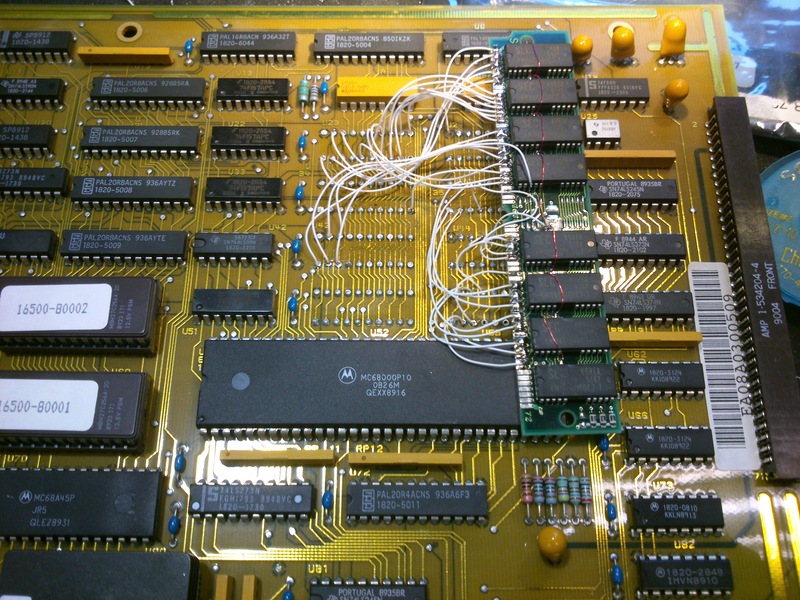 As part of my quest to upgrade my HP 16500A logic analyser’s memory, I’ve found out more than I ever expected about the various versions of the 16500A CPU board. I’ve been fortunate to have the help of the good people of the [hp_agilent_equipment] Yahoo! group. My most recent stumbling block has been that installing ROM version 00.02 in my (early) 16500A stops the floppy disc drives working. 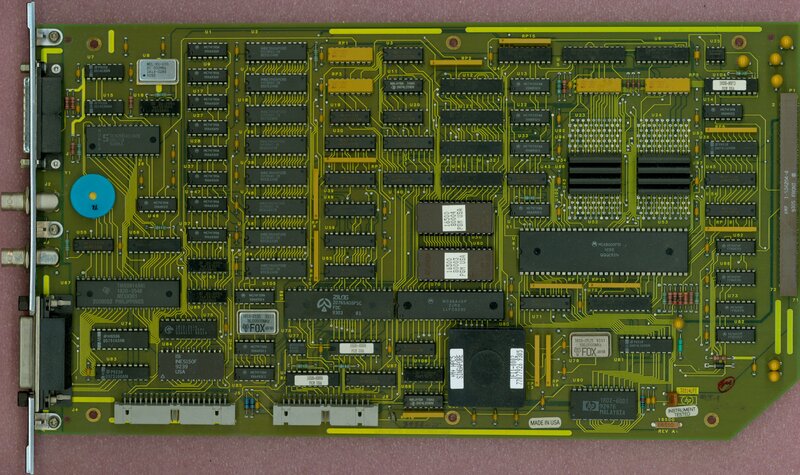 Glen Slick, from the above group, was kind enough to send me high-resolution scans of the two 16500A CPU boards he has. That makes three known versions, and here I’ll post pictures of them and attempt a description of the differences. This is the board from my machine. 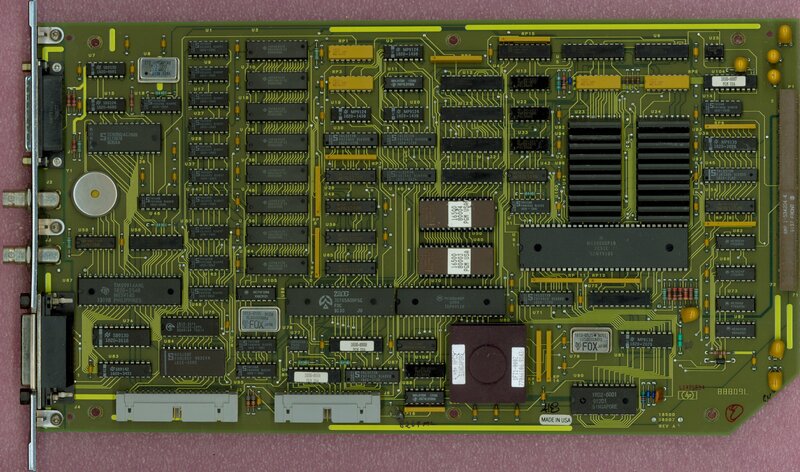 It has 1MB RAM in 8 TMS44C256-12N DIL chips, and the floppy disc controller is a Standard Microsystems FDC9793. 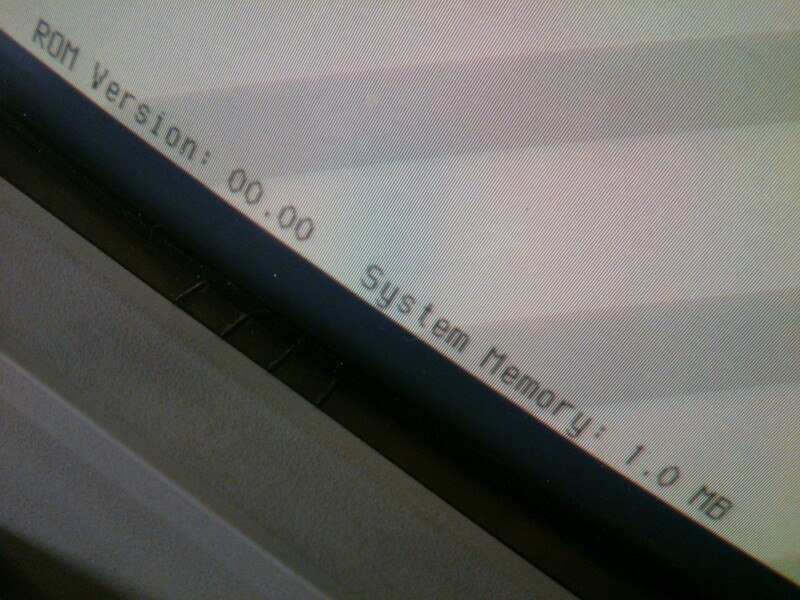 The ROMs contain software version 00.00. For completists, I have put images of the V00.00 16500A ROMs here. This is another of Glen’s boards. The part number (66510) seems to be on a sticker. 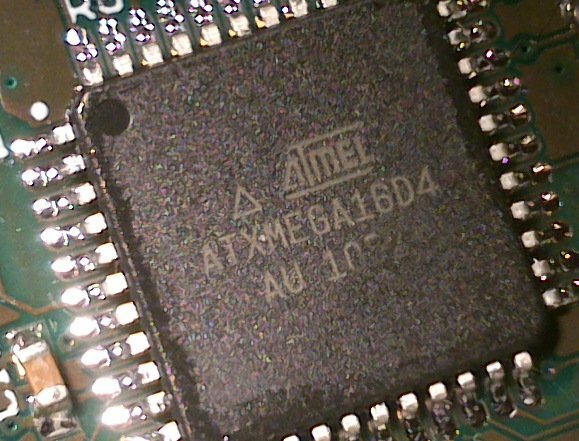 The only noticeable difference, other than the RAM chip complement, from the 66507 board is that the chip top right is labelled 16500-80013. It has 4MB of RAM as 8 off TC514400AZ-80 4Mbit ZIP chips. The ROMs contain software version 00.02. This entry was posted in HP 16500A/B and tagged 16500A, electronics, hp, test equipment, vintage on January 30, 2013 by martinjonestechnology. I’ve just brought up a project using an Atmel XMEGA series microcontroller which uses an external 32.768kHz crystal to run its real time clock (RTC). I had some trouble getting it to work, but now I’ve found the recipe, thought I’d share it in case it’s useful to anyone. In principle, you’re supposed to enable the crystal oscillator and then wait until the XOSCRDY bit is set in the OSC.STATUS register, indicating that the oscillator has started up. 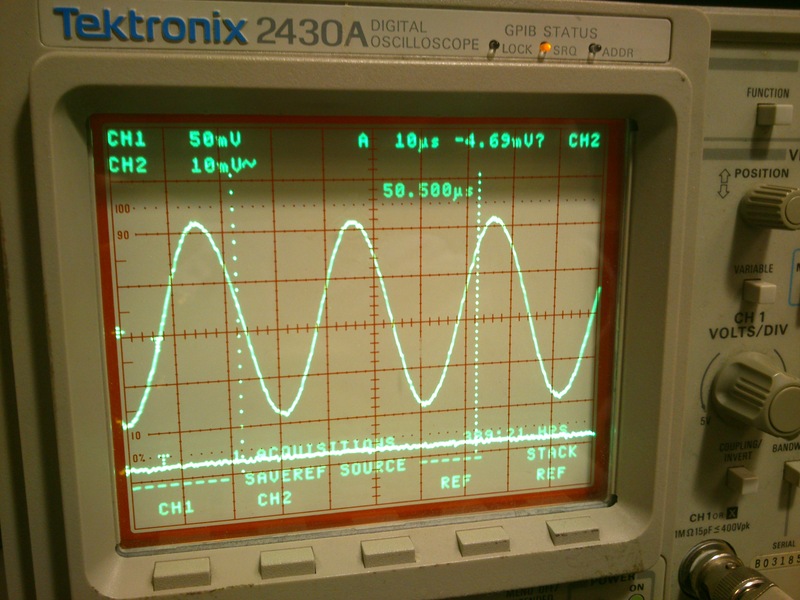 My problem was that the oscillator seemed to be running, with a healthy-looking waveform at the XTAL1/TOSC1 pin, but the ready bit never got set. That’s what worked for me. I’m using AVR Studio 6 and AVRGCC version 3.4.1.95. 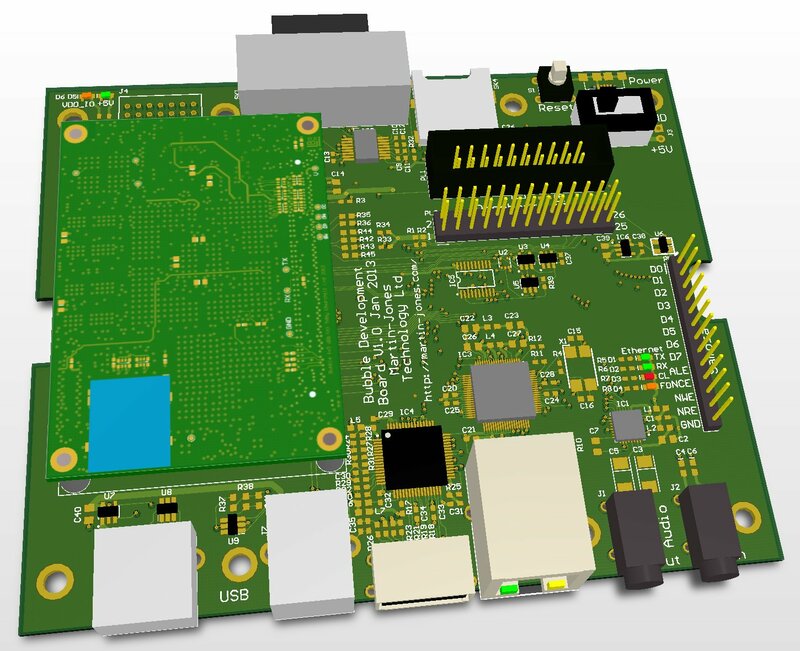 This entry was posted in Projects and tagged atmel, avr, electronics on January 25, 2013 by martinjonestechnology. I’ve just got V1.0 of a development board for the ‘Bubble’ embedded ARM module ready for manufacture, and will hopefully have prototypes soon. It’s all powered from a Micro USB connector which should take a standard mobile phone charger, and is designed to sit neatly in a low-cost plastic box for protection. Everything except the Ethernet port is already supported by Linux on the Bubble board, though making the HDMI port work will involve some fiddling with the LCD output timings. The Ethernet port is based on the Wiznet W5100 chip, which is popular in the embedded community and is supported by recent Linux kernels. This entry was posted in Bubble, Projects and tagged ARM, Bubble, electronics, embedded on January 24, 2013 by martinjonestechnology. I’ve just got an old Super Pacman arcade game running. 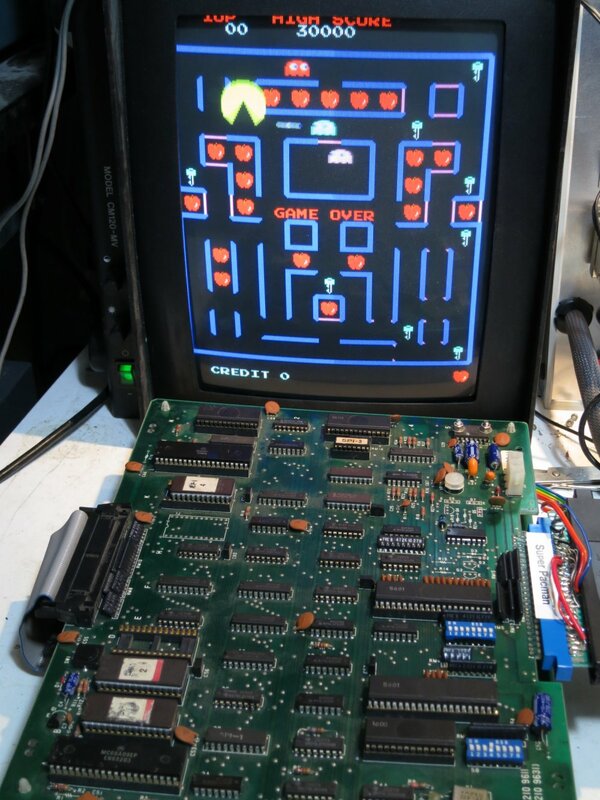 Not the whole cabinet, you understand, which would be inconveniently large, but the circuit board from inside one, connected up to a monitor and joystick.It’s the lesser-known 1982 sequel to Pacman and Ms Pacman. It’s a fun game, with more complicated gameplay than the original: gates, keys, a speed-up button and a special powerup which makes you really big and able to go charging through everything. I could find hardly any repair information about Super Pacman on the internet, so I thought I’d paste my repair log here so people can see it. 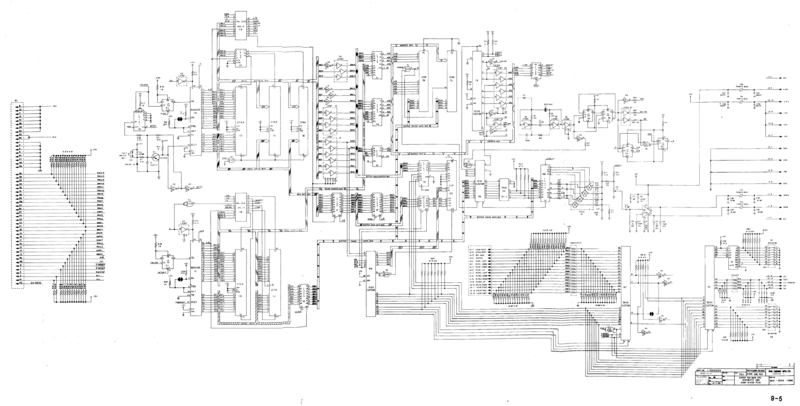 Firstly, as part of the process, I pasted together large high-resolution circuit diagrams by cutting and pasting from the available PDFs of the manual in which they’re sliced up into pages. The ones I’ve stuck together are more convenient to use when printed out on large sheets of paper or viewed on a big screen. I hope they’re useful. Connect up power and video. Occasional flashes of something on the screen but no sync. Main clock oscillator is running. Lack of sync output seems to be due to unenthusiastic 74LS10 at 3A. Output at pin 12 is weak. Vertical sync input at pin 13 is OK but H sync input at pins 1 and 2 is very poor – barely leaving +5V but pulses are visible. 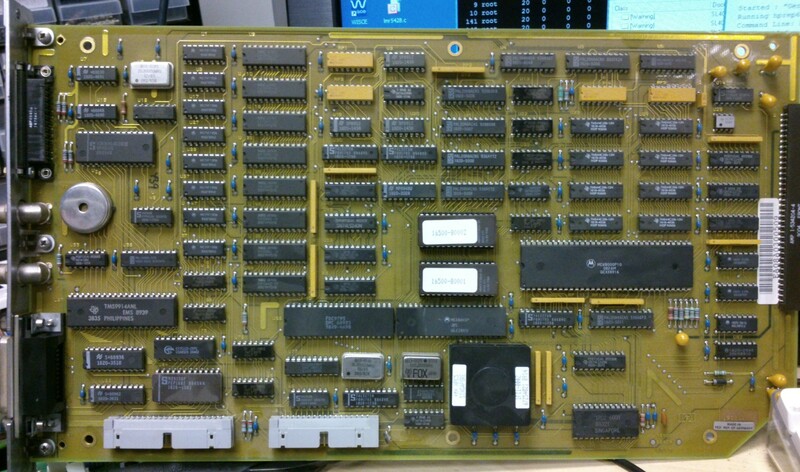 Comes from a custom chip 2C. Hope it’s not knackered. Cut pins of LS10. Replace 3A. Now we have a picture of random junk in blue and green which wriggles a bit when reset button is pressed. Why does there appear to be no red in the picture? There’s activity on R video pin even though pin 1 of colour PROM 4C has snapped off. Maybe a blanking problem. RGB outputs are high during what should be blanking interval. Investigate inputs to PAL 4D. 6/7/8/9 are all stuck high. They come from 74LS298 4L, whose inputs looks pretty sensible but outputs are all stuck high. Remove it ready for replacement. Blanking signal from 3A pin 6 ends up at PAL 4D pin 19 and seems to force its outputs to 01111. In this state, output of colour PROM 4C is 10101111. That’s definitely wrong according to the MAME ROM image. Should be 00000000. Now colours are sensible. Maybe 4L (74LS298) isn’t faulty after all – It might just be that no sprites are displayed so there’s no activity. PROM at 4E is losing pin 1. Need to sort it out. Try and work out why game doesn’t run. Activity on data and address buses. EPROMs 1 and 2 (1B and 1C on CPU board) verify OK. When it stops, it’s resetting the watchdog continuously! Sound CPU isn’t running cos its reset input (37) is low. Comes from latch 2M (74SL259). Pulling it high for a moment makes it stay high, oddly. Repair pin 1 of PROM 4E with Dremel and bit of wire. Screen of random characters looks more and more sensible: the word ‘CREDIT’, or bits of it, seem to be appearing in places. Replace suspect 74LS298 at 4L now replacements have arrived. Makes no difference at all. and the original is faulty. Game still doesn’t run. Can’t see any dodgy logic levels on video board and piggybacking RAMs doesn’t help. Still no interrupts happening. 74LS259 at 2M on CPU board is behaving oddly. It is being addressed but none of its outputs are changing, but if I pull any of them high for a moment they stay high. When CPU crashes, it sits in an 8-cycle loop. Record what’s going on. It’s in a tight loop at E178-E17F, which finishes by writing the value 0x31 to 0x8000. That’s the address which resets the watchdog. Analysing the code in MAME, it seems that the first part is a RAM test which copies the ROM (from E000 onwards) into the RAM and reads it back, comparing it with the ROM. 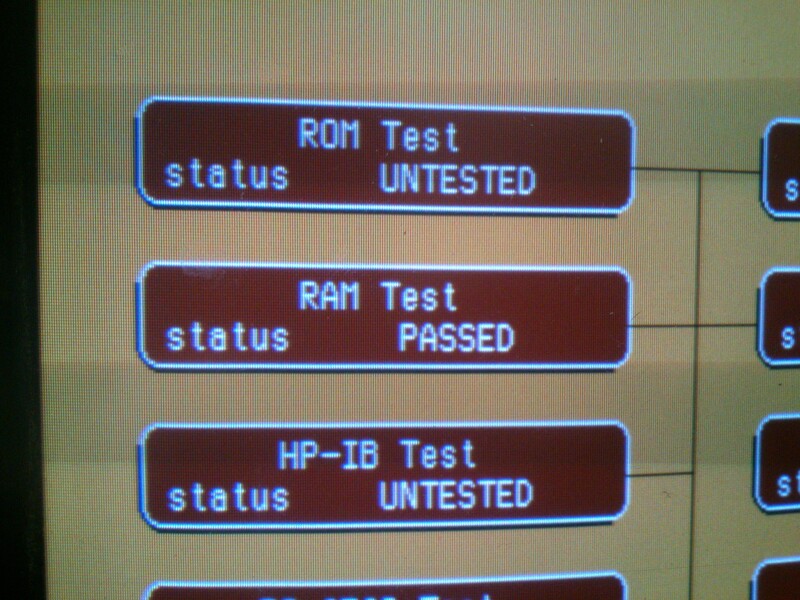 If it fails, it will try to put up the self-test screen indicating which RAM has failed, then go into the loop at E178. A value of 0x31 in A I think indicates that the tilemap RAM has failed, at 2E on the video board. So it seems that the first RAM test is failing and it’s trying to tell us about it, but access to the video RAM is so broken that we can’t see it. The CPU is actually running correctly. Replace RAM 2E. Doesn’t make any difference, but if I remove buffer 1E the screen should clear with after the RAM test. It doesn’t, and behaves a bit randomly. Remove custom 00xx at 2D, which is the video address generator and thus has the ability to mess up video RAM addressing, and game appears to run! But tilemap is all the same character, not surprisingly because nothing’s generating video addresses. Pin 1 has dropped off 00xx. Temporarily connect it with scalpel and we have action. Repair pin 1 properly and game runs. Try inserting coins by tickling edge connector with grounded wire. We can start a game and control Pacman. Pinout seems to be the same as Grobda but with player 1 and player 2 swapped over. Wire up single player JAMMA adapter. Sound works! Pleasant surprise. Some sprites sometimes become white squares, but reseating customs on video board solves the problem. This entry was posted in Arcade and tagged arcade games, electronics, vintage on January 21, 2013 by martinjonestechnology. 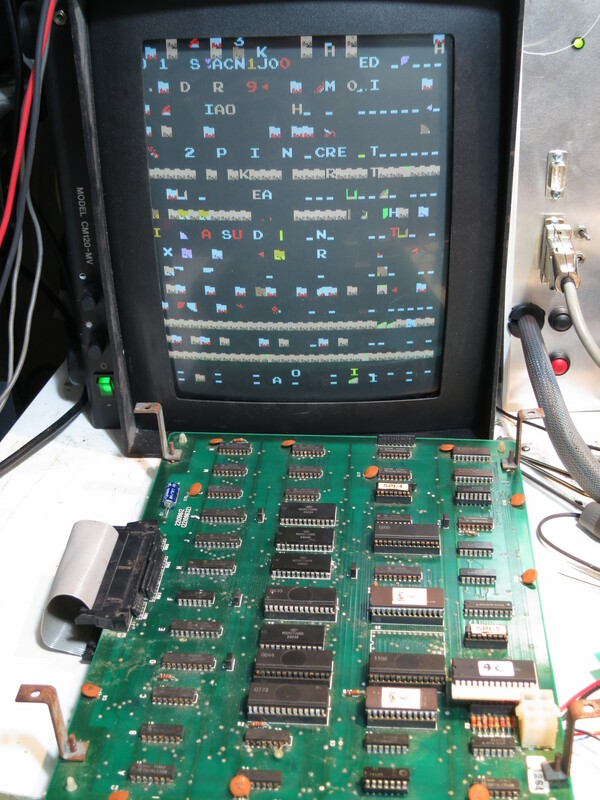 In part 5, upgrading the software on my 16500A’s CPU board to version 00.02 resulted in a self-test failure, which wasn’t fixed by downgrading back to 00.00. I’ve just had a look to see why that was happening. There was no activity at all on pins 6 and 8, the data pins, even during self-test. I traced them through to the CPU board via pins 59 and 60 of the CPU board’s backplane connector, and thence to U90 pins 18 and 19. This is an HP custom chip. There seemed to be activity on many of its pins, but nothing on those two. Poking around, I found that two of its pins are connected to a nearby ceramic resonator which clearly wasn’t resonating. Aha! Got it. One of the pins of the resonator had broken. I soldered it back together and now the self-tests pass! But there’s a fly in the ointment. V00.02 software doesn’t seem to be able to access the floppy disc drives, simply reporting ‘No Disc’ for both of them even when they’ve got discs in. It seems that the ‘disc change indicator’ has moved at some point in the history of Sony disc drives. Maybe the new software is expecting to see the ‘disc change’ indicator before it tries to switch the drive motors on? Grounding pin 34 doesn’t seem to make any difference. The disc controller is an FDC9793. Looking up the data sheet on it, it doesn’t have any means of indicating whether a disc is in or not. Without a schematic, it’s going to be very hard to figure out how the software determines it. 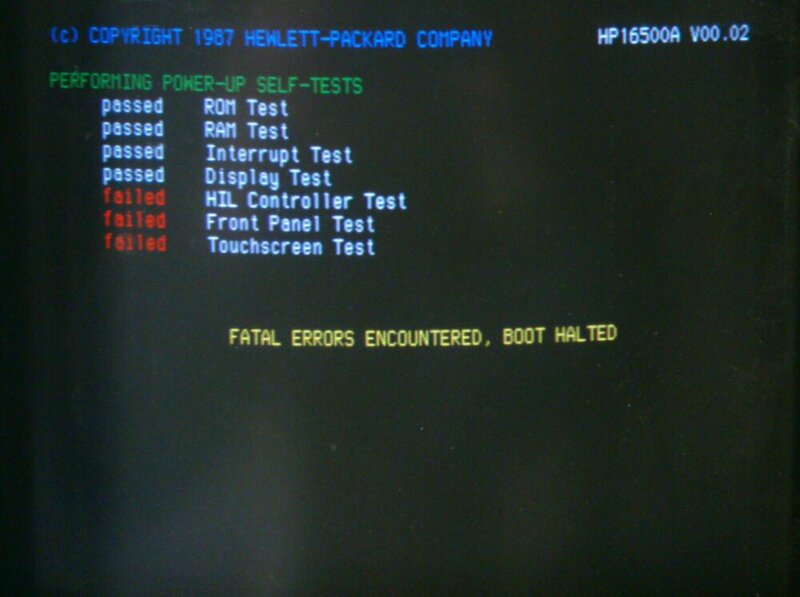 This entry was posted in HP 16500A/B and tagged 16500A, electronics, hp, test equipment, vintage on January 21, 2013 by martinjonestechnology. Following on from part 4, I’ve now tried a newer software version in the 16500A’s EPROMs. Finding a couple of good 27C256s with 200ns access time took a few minutes, but there were no problems with the programming. So, I put them in the CPU board, reinstalled it in the mainframe, and switched on: Oh dear. That’s not good. Without HIL (which is the socket for mouse and keyboard on the front), front panel (which I assume is the spinner knob) or touchscreen, the machine isn’t a lot of use. Must be a compatibility problem with the new software version, I think to myself. Swap in the old ROMs – and the problem is still there. Check the wiring to the front panel, all looks good. This is annoying. I wasn’t expecting new faults with the hardware. When I next get time to spend on it, I’ll do the obvious checks for bent pins and so on. This entry was posted in HP 16500A/B and tagged 16500A, electronics, hp, test equipment, vintage on January 19, 2013 by martinjonestechnology. Having worked out the wiring for a 4MB SIMM to the 16500A CPU board in part 3, I got out the mod wire and soldered it all together. It all went together quite easily. The pins, even on the SIMM, are so much further apart than modern surface-mount components that I’m used to dealing with. Notice the red wire running along the row of chips on the SIMM: that’s nOE, where I had to lift pin 16 of each chip and wire them together because the original SIMM tracks grounded them. I also cut the track joining all the pin 3’s (nWE) of the chips together, half way along the SIMM, so that the upper four chips had a separate nWE from the lower four, again because that’s the way the CPU board expected them. At least the new RAM works as well as the old stuff did, even if it isn’t any bigger. I haven’t broken it, but I haven’t improved it either. I also tried loading the 16550A module software, just in case it was somehow able to find the extra RAM even if the rest of the system didn’t know about it, but it still reported that there wasn’t enough space. This entry was posted in HP 16500A/B on January 18, 2013 by martinjonestechnology.